If I had a zillion dollars, I’d add these two pieces to my Stephen Sprouse collection. 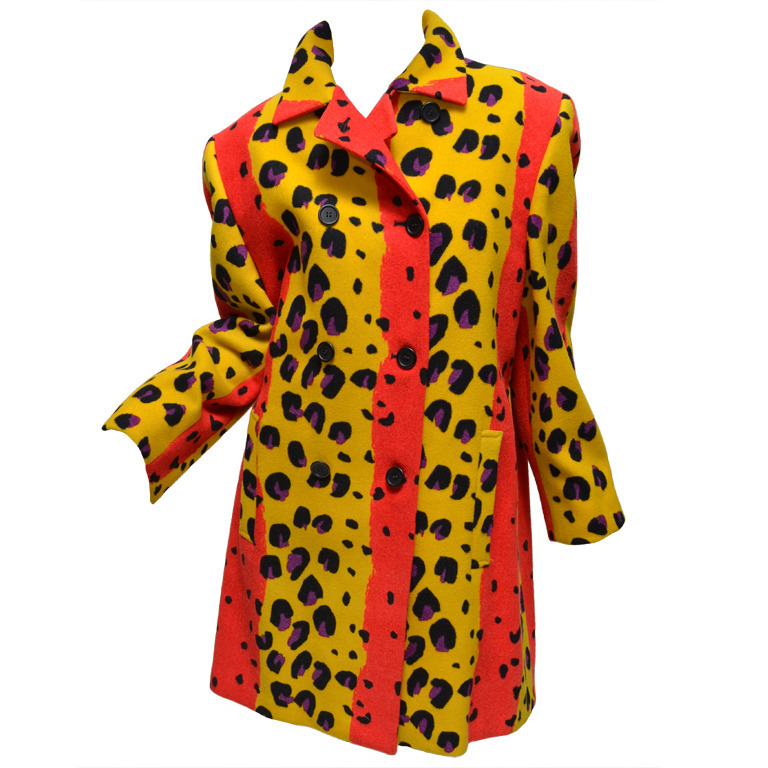 I love neon, leopard and Sprouse, so a neon leopard coat by Sprouse blows my mind. Vintage 1980s Sprouse coat. $1,400 on 1stdibs.com. Click for more information. 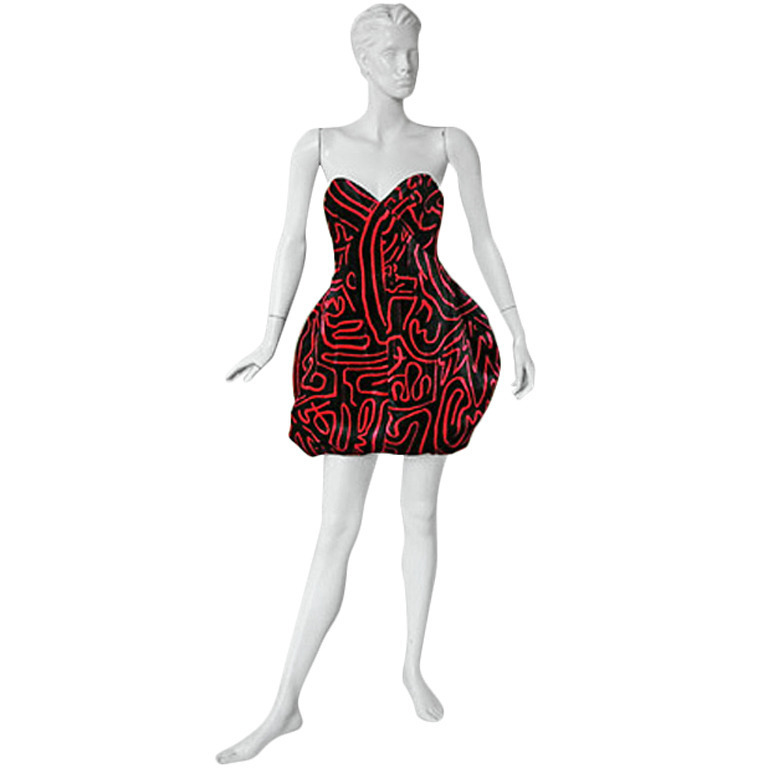 And I’ve always pined for the original Keith Haring skirt that Madonna wore in her “Borderline” video, but I guess I would settle for this crazy 1988 Haring/Sprouse pouf dress. I won’t be getting an $8,500 dress, unfortunately. Click for more information on 1stdibs.com. While I won’t be getting either of these pieces, it’s clear from my taste that I won’t be starting one of those minimalist, “it’s my uniform,” capsule wardrobes either! Ooooh, that dress is super cool. Right? I’m obsessed with Keith Haring lately. “Loud and bright” is a uniform, right? Okay, so I CAN have a uniform! Wendy, your style is the Anti-Uniform. 😉 It works for you though, and you know what they say about if it ain’t broke…. The closest thing that I have gotten to Sprouse was when Target had a Sprouse summer collection. I got a hat, flip flops and a “USA” t-shirt. I have coveted Madonna’s skirt since the first time I laid eyes on it! The Target stuff was cute! You know me and my lack of wardrobe color, but I’m kind of into that dress! It does have black in it! Ha ha! I was just going to suggest that if you did decide you wear uniforms you would take it to the next level, as per your reply to déjà pseu.